Download "Realizeit at the University of Central Florida"
3 2 Introduction This document summarizes the results of a research study carried out by Dr. Charles D. Dziuban (Director) and Dr. Patsy D. Moskal (Associate Director) of the Research Initiative for Teaching Effectiveness at the University of Central Florida (UCF). The study was conducted during an initial trial of the Realizeit system in two Fall 2014 courses and was designed to provide an initial gauge of the effectiveness and impact of Realizeit on student outcomes. In addition to effectiveness, the UCF research team also measured student s perceptions of instruction and Realizeit through the use of surveys. gauge the effectiveness and impact of Realizeit on student learning The study followed two courses: one in the field of Psychology (General Psychology), and one in the field of Nursing (Physiospathology). To allow the effectiveness of Realizeit to be measured and compared, the courses were run utilizing three different instructional models. For each course, one group of students used Realizeit, one group used the current UCF online platform, while the remaining group engaged in traditional face-to-face or non-adaptive online learning. 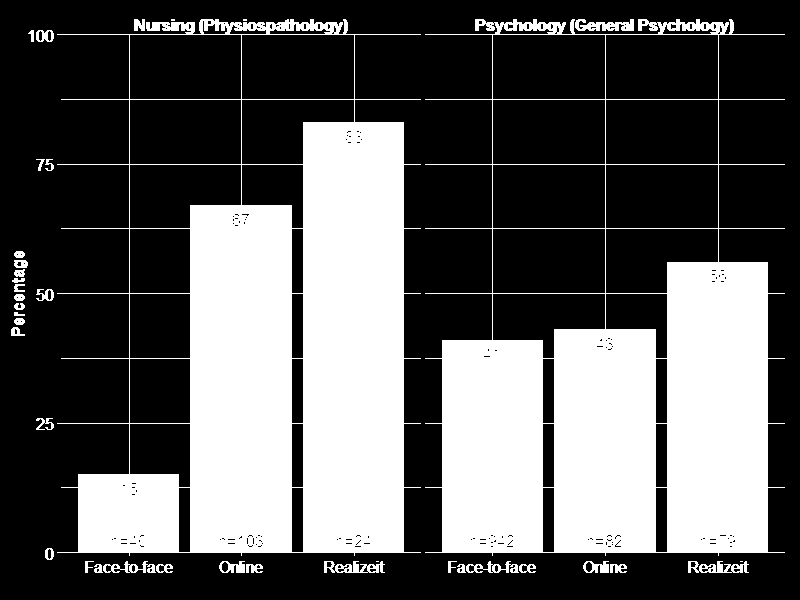 The Psychology and Nursing comparison courses had several sections, each with a different instructor. The Psychology course consisted of 8 objectives, covered 213 concepts and had 125 students enrolled. The Nursing course consisted of 3 objectives, covered 42 concepts and had 34 students enrolled. These students covered a wide range of demographics. The remainder of this document is divided into two sections. The first examines research into the effect of Realizeit on student outcomes. This is achieved by comparing outcomes on both internal and external exams. Following this, the UCF team built two predictive models which use key learning metrics from Realizeit to predict outcomes on an external exam. The second section examines student s perceptions and satisfaction with their course experience with Realizeit and the course format. 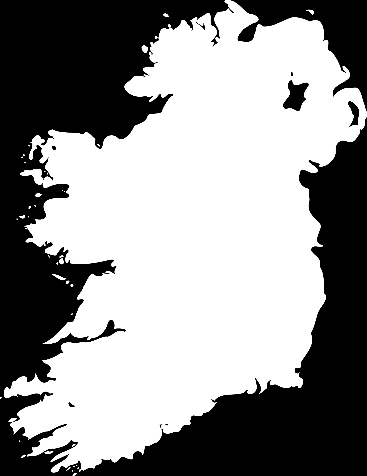 In addition to the survey, the researchers ran a principal component analysis, to determine if there were any underlying themes present in the response data. 6 5 Psychology GEP exam As a part of their final assessment, students on the Psychology course were required to complete an external General Education Program (GEP) exam. This provided an opportunity to use an objective measure of achievement across all groups within the course regardless of the instructional model they used. Realizeit produced a far more homogenous set of results, without the extreme lows experienced in the other groups The researchers found that there was no statistical or practical difference between the average performance of students from each group, with each group achieving an average of approximately 85% (depicted via the circles in Figure 2). However there is a large difference in the range of results obtained. For each group, the range is depicted using the horizontal bars while the average of the low outliers are depicted using the diamonds in Figure 2. The researchers found that the group of students who used Realizeit produced a far more homogenous set of results, without the extreme lows experienced in the other groups. This suggests that there may be a level of consistency in the outcomes and learning experienced by students using Realizeit that is not found across those in the other groups. 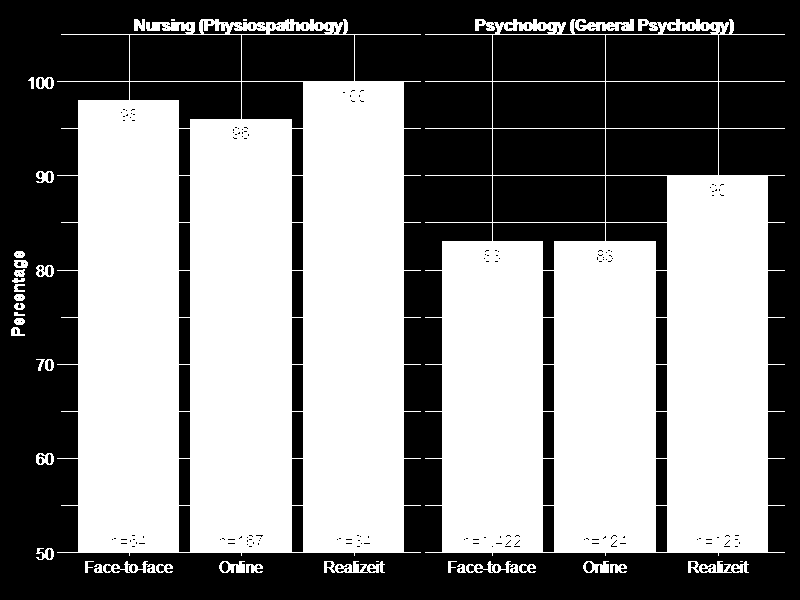 As mentioned by the UCF researchers, one possible explanation for the large range of results in both the face-toface and online groups is the huge variability in the experience and standard of instructors and their grading schemes. This variability can be smoothed out by a system such as Realizeit, which can account for individual needs. Figure 2: The outcomes on the GEP exam. 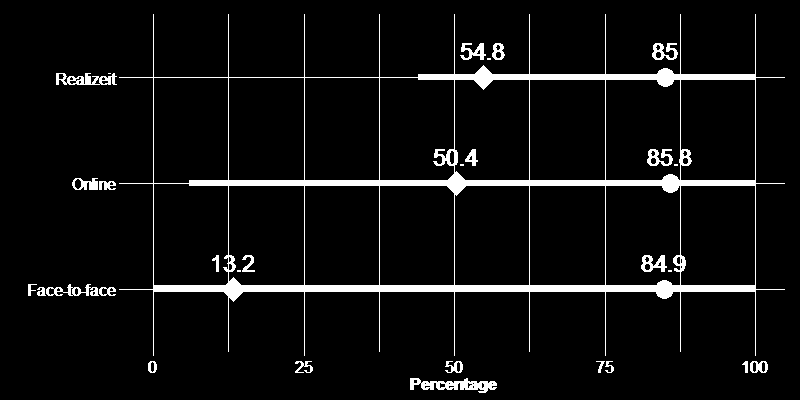 The horizontal bar represents the range of results for each section, the square is the average result, and the circle represents the average of the low outliers. 7 6 It is also worth noting that the GEP exam accounted for a different percentage of a student s final course grade depending on which group they were in. This could bias the results somewhat due to it being more important for some groups than others. Model to Predict Outcome on Psychology GEP Exam Given the results on the external Psychology GEP exam, the researchers were interested in determining if there is a relationship between these results and the metrics reported by Realizeit. Building on this, they wished to use complex relationships to construct a predictive model. They ultimately built two models. The first looked at predicting the GEP exam results from Realizeit module scores. 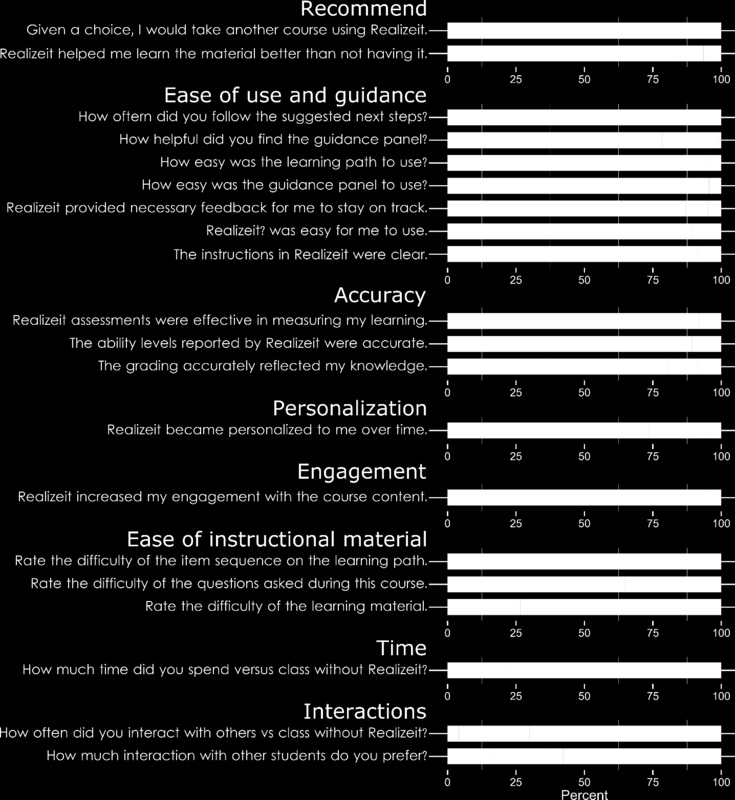 The second used Realizeit-specific learning metrics to achieve the same goal. The Psychology course was broken into 8 objectives or modules, each of which contained several nodes or concepts. Realizeit provides detailed granular metrics on each of these concepts and allows them to be aggregated to the module or course level. Realizeit Module Scores The first model used the learner s score, as generated by the course specific grading formula within Realizeit, aggregated at the module level to predict the GEP exam scores. Figure 3 displays the correlation of each of the module scores with the GEP exam score. 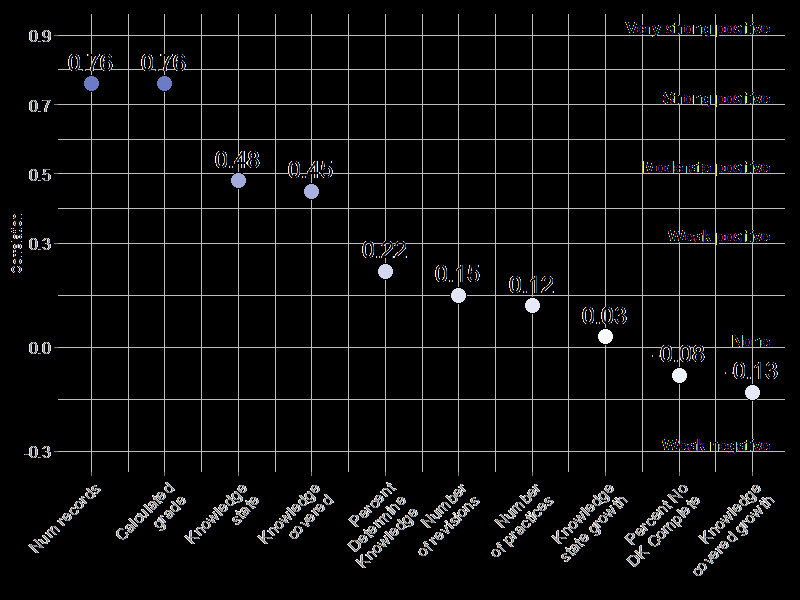 All modules correlated positively with the exam score with most having a strong to very strong linear relationship. This means that the higher the score the student achieved on these modules, the higher their exam score. The main outlier module is History and Research. This could be explained by the fact this is the first module in the course and mainly serves as an introduction. These strong relationships suggest that a predictive model is, indeed, possible. Using a stepwise linear regression procedure, the research team at UCF were able to construct a model using scores on just three of the eight modules that produced an adjusted R 2 of 0.64. 13 12 Principal Component Analysis of Student Perception of Realizeit Principal component analysis determines if there are any underlying hidden traits or components that exist behind a set of data. The research team at UCF used this technique to analyze the student responses. The team found two traits. 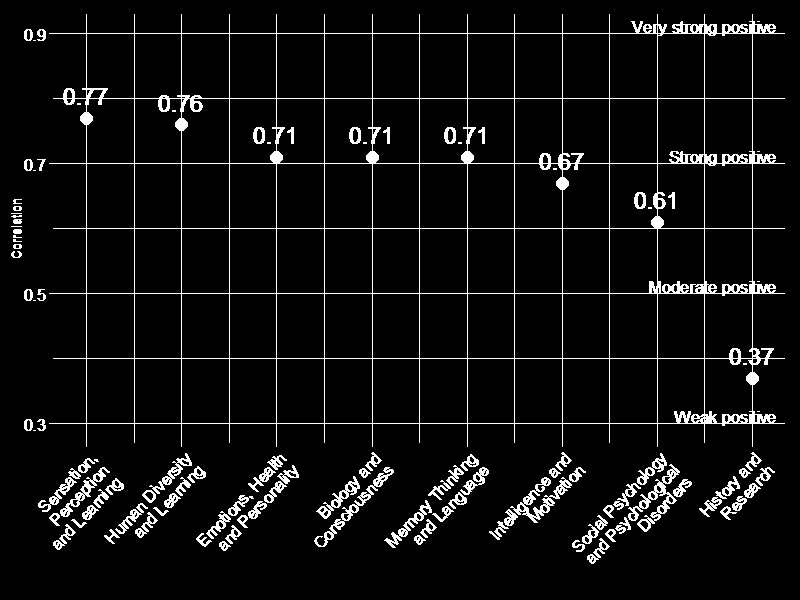 The relationship between each of the survey questions and the traits can be visualized in Figure 6. The researchers labeled the traits as follows: Did Realizeit create an Effective Learning Climate? What was the level of Engagement Effort required? 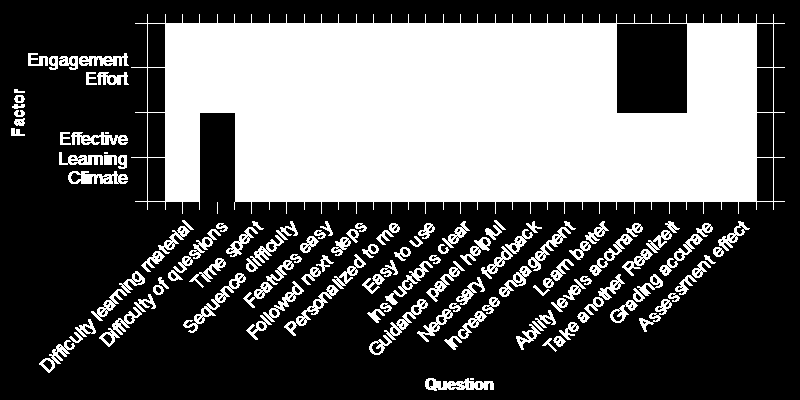 These new traits allowed the researchers to summarize the students answers to the survey questions using these two components. Following on from this analysis, the research team then compared the students scores on these components to their answers to the survey item Realizeit helped me learn. They found that the more positive the student s response to Realizeit helped me learn the higher the Effective Learning Climate and the higher the Engagement Effort components. Interestingly, this suggests that although it required more effort, the willingness to engage was high because students believed it created an effective learning climate. This supports the conclusions from the previous analysis and implies that if Figure 6: The reduction of the space from 17 questions to 2 underlying principal components. The shading represents the size of the coefficient that relates a question to the components. 17 16 One group of 172 students from the General Psychology course, Three groups (one fully online and two blended) totaling 94 students from the Nursing (Physiopathology) course, Two groups totaling 59 students from a College Algebra course. As the work presented here is published by the researchers, appropriate references will be added to this document. Introduction: Blended learning is defined as to combine Face-to-Face instruction with computer-mediated instruction Graham 2006. Mixing technology and content does not necessarily yield effective learning. To achieve this aim, UDC-CC committed staff and resources to implement the following priorities: (Priority Update Document Feb. The Journal of Interactive Online Learning Volume 1, Number 3, Winter 2003 www.ncolr.org ISSN: 1541-4914 Analysis of the Effectiveness of Online Learning in a Graduate Engineering Math Course Charles L.
Should Graduate Mathematics Courses Be Taught Fully Online? D R A F T. Faculty Senate Ad Hoc Committee on Quality in Online Learning.